Summary On 21 March 2019, the RobertsDay Perth Studio coordinated a half day Complete Streets â&#x20AC;&#x2DC;Innovationâ&#x20AC;&#x2122; Workshop, including participation from representatives of the Town of Victoria Park and Department of Transport. 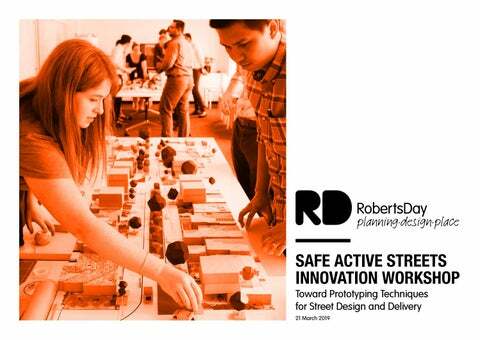 Using a local street within Victoria Park, the purpose of the Innovation Workshop was to test a methodology and process that could be emulated with other stakeholders and community on future Safe Active Street projects. The workshop involved an overview of delivered projects within the Perth Metro area, a visioning session, an ideas and problem solving exercise, concluding with a prototyping design session using a physical model. This Report is a snapshot of the activities that occurred on the day, with supporting information on some of the key technical issues covered in the workshop. The focus is on the innovative processes and methods trialled during the workshop, and it is not intended to be read as a proper design report presenting resolved concepts or technical justification. us to test our ideas quickly and improve on them in an equally timely fashion. The Institute of Design at Stanford encourages a “bias towards action”, where building and testing is valued over thinking and meeting. The Town of Victoria Park advised that Gloucester Street is a ‘Priority Project 4’ in their joint 5-Year Implementation Bicycle Plan with the City of South Perth. This project was deemed high in terms of strategic importance, but can still be informed by any workshop outcomes given concept planning has not begun. Legend The street is predominantly residential, Prioritised Proposed Projects and is representative of a typical Rail Stop Á local " Separate d Path (B ikes Only) street in a middle ring Perth suburb. The Railway High Quality Share d Path (B ikes and DoT advises that Gloucester StreetFreeway could Pedestrians) Highway serve as an important strategic bicycle Bicycle Lanes or Sealed Shoulders Main link for commuters to the Perth CBD, Bicycle Boulevard Safe Active Street Minor while the Town’s Place team is interested LGA Boundary (Town of Victoria Park/City of South Perth) in design outcomes that increase the quality of public realm for its residents. RobertsDay set out to contribute toward this initiative, by arranging an Innovation Workshop to focus on trialling several possibilities for a more effective community engagement and design process. There is an opportunity to reimagine local streets as a whole, taking the focus away from cycling alone, to perceiving the street as an extension of living and recreational space for residents and visitors. The Town of Victoria Park has an innovation team and is highly aligned with RobertsDay’s values, with the added bonus of an established working relationship with the DoT on delivering more Safe Active Streets. There is an opportunity to better explore the links between changes in the urban fabric for both public and private realms, as an incentive for communities to view density positively when coupled with street improvements. The Department of Transport (DoT) has implemented a number of pilot Safe Active Street projects, which seek to convert local streets to lower speed environments (30km/h) and create a ‘shared space’ for vehicles and cyclists. Originally done under the banner of ‘Bicycle Boulevards’, DoT now refers to them as ‘Safe Active Streets’, to better market the benefits of a lower speed environment to adjoining residents (not just cyclists). Many of the delivered streets’ original design intent has been compromised / watered down by requests from agencies (eg. wider roads and turns for refuse trucks etc.) and community resistance (eg. rejection of new verge landscaping over concern of loss of parking). Knowledge Exchange Key Findings  Project costs currently borne by Department of Transport.  Local Governments that have identified local streets requiring resurfacing can consider Safe Active Street funding from the Department to pay the proportion of costs up and beyond ordinary capital works.  High drainage costs, including modifications to existing systems, have pushed project budgets higher than desired.  Traffic Management costs generally represent 40-50% of total project cost.  The notion of slower vehicle speeds to improve liveability qualities can be counter to Main Roads WA objective of improving overall ‘network efficiencies’.  Local Authorities can attract grants from Main Roads WA where ‘efficiency improvements’ can be proved. However, interventions and intersection upgrades for local streets (such as roundabouts) can be to the determent of human comfort, liveability and quality of place.  Local streets require better technical guidance in place of Austroads standards that are geared toward vehicle safety for higher speed environments.  Local Authorities need to balance any perceived liability risks for introducing community focused infrastructure with the net-benefit and improvement to liveability and productivity of land (eg. swings, pseudo cricket pitches, communal verge gardens etc.).  A Safe Active Street could influence the behaviour of motorists within a locality’s broader street network, encouraging vehicles to use distributors rather than local streets for through movements.  Quantify the benefits and evidence coming out of built projects, to better communicate the project advantages to decision-makers and community. How can Gloucester Street become a key strategic cycling link and encourage more local trips to be made on foot and by bicycle. How can Gloucester Street act as an extension of private living environments for local residents, and encourage people to linger and enjoy the public realm. Prioritise pedestrian connectivity in addition to cyclist access and ensure that their needs are given priority over cars where required. Commit to completely filtering, rather than simply slowing, traffic in order to restrict vehicle movements to local traffic and establish active transport as the predominant use. Deliver access improvements in tandem with landscaping improvements targeted at enhancing the natural environment, including infill tree planting, replacement of turf with native landscaping, replacement of hard drainage infrastructure with infiltration basins and localised detention. Ensure streets are developed as places to linger in where public life can thrive, not just corridors to move through. Design streets to provide suitable verge space for community infrastructure such as benches, barbeques, seating, playgrounds, cubbies and vegetable gardens. Focus on creating cohesive and considered urban design outcomes that move beyond generic road engineering interventions and speak to the character and history of the place. Employ a simple but refined palette of materials, generous landscaping and a minimal approach to linemarking and signage to create an immersive and enjoyable public space. ROLE-PLAY To inform any design process, role-playing can be a valuable exercise for audiences that are primarily technical in nature. By allowing practitioners and public officers to view the site through the lens of the end users, it allows issues to be both identified and balanced in pursuit of formulating an equitable design outcome. Ideation What would Gloucester Look Like as a living Environment? What are the likely challenges and barriers to realising these ideas, specifically children’s play spaces ? How can we evolve and the idea to address and respond to these challenges? How can we deliver Testing and Tactical Urbanism? Project Vision Participants were asked to describe the street, as though they were a resident or a visitor 10 years from now. Only verbs or adjectives were allowed. Tactical Urbanism Tactical Urbanism is a form of prototyping design solutions in the ‘real world’, and should be seriously considered as a tool for: 1. Testing and measuring the effectiveness of design interventions, before committing significant funds for permanent change. 2. Demonstrating impact of design changes to community and stakeholders, before agreeing to any final plan. A ‘Public Experience Period’ could be as short as one day to test a road closure or up to one month to assess impact on practicalities such as rubbish collection, pedestrian and cycling usage rates, and vehicle speeds. for the project. The model provided a basis for the RobertsDay designers to draw quick design sketches to articulate the concepts tested by the workshop participants. The sketches are not resolved designs and were undertaken in the hour immediately following completion of the workshop prototyping exercise. Concepts are shown in the pages following.